The Economic and Financial Crimes Commission has recovered 50 Certificates of Occupancy bearing the name of a former National Security Adviser, Maj. Gen. Abdullahi Mukhtar (retd. ), and his wife, Binta. It was learnt that the documents were recovered from one Akka Danagundi, a brother-in-law to the ex-NSA. 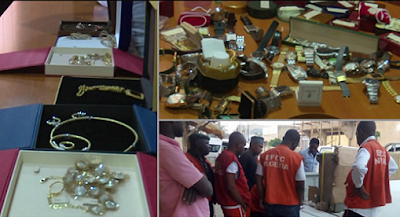 According to the EFCC, the jewellery were found in a fireproof safe hidden in a house belonging to Danagundi at 375 Gwangwazo Quarters in Kano, Kano State. The commission stated that the discovery was sequel to an intelligence report alleging that huge sums of money, including foreign currencies, were hidden on the premises. The EFCC said, â€œDuring the operation, Aiko Fireproof safe and seven suspects, including the house owner, Danagundi, were arrested and brought to the EFCCâ€™s Kano Zonal Office, where their statements were taken. â€œOn arriving at the commissionâ€™s Kano Zonal Office, the safe was opened and jewellery, such as necklaces and wristwatches, including 50 Certificates of Occupancy for properties located in Kano, Kaduna and Abuja were found. It was learnt that all the suspects arrested during the operation were released on administrative bail with the exception of Danagundi, who is still in custody, assisting the investigation.